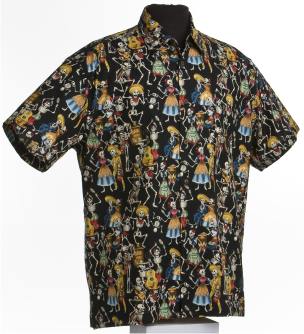 Day of the Dead themed Hawaiian shirt celebrating the culture and traditions of this latin holiday. This shirt is made of 100% combed cotton and is made in the USA. It features matched pockets, real coconut buttons, double-stitching, and side vents so shirt can be worn outside or tucked in. The price is $57.95 for sizes S-Xl, $59.95 for XXL, $61.95.95 for XXXL, and $63.95.95 for 4XL. Day if the dead or dia de los muertos is a holiday that has been celebrated in the latin culture for thousands of years. This is not a Mexican version of Halloween. Though related, the two annual events different traditions and tone. Whereas Halloween is a dark night of fright and mischief, Day of the Dead Festivities unfold over two days in an explosion of life affirming joy. Assured that the loved ones that passed on would not want to remembered with mourning and sadness, Dia de los Muertos celebrates the lives of the deceased with food, drink, parties, and activities the dead enjoyed in life. It is believed, at midnight of the 31st the gates of heaven open up and they are awakened loved ones share in the celebrations because dead souls do not want to be remembered sadly.